Apologies for any delay in posting this continuation from the all day session that started with Lantana Cafe, just the usual stuff like life getting in the way again. So after brunch at Lantana, a steady wander around Spitalfields and a few drinks later at a local pub followed. 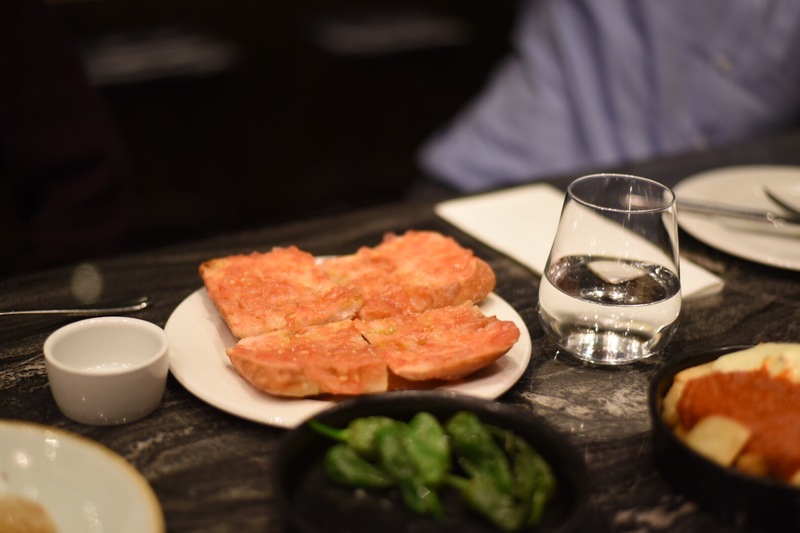 As always the idea of sustenance was never far from our minds, so the job came to me to find somewhere to graze – tapas was the suggested option. 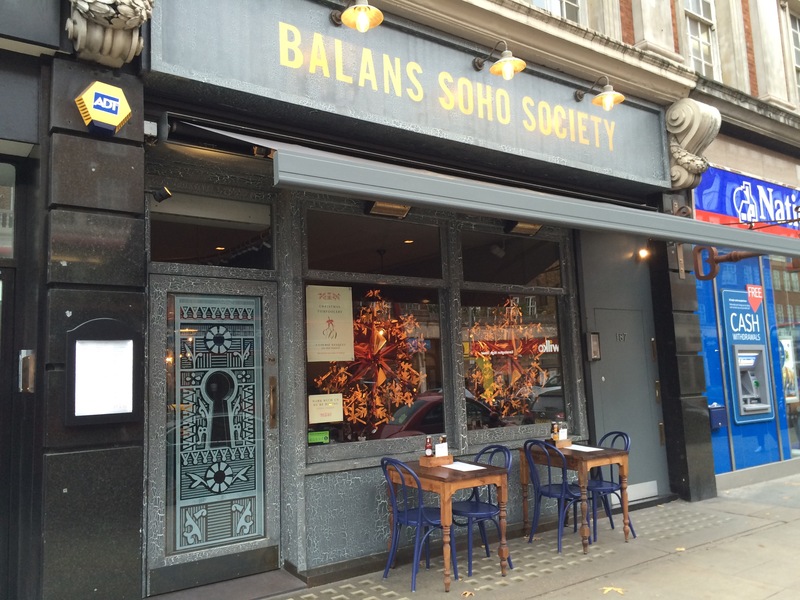 Fine, I was ok with that and had a couple of suggestions up my sleeve – the first was Copita Del Mercado, bit was the closest but their opening hours didn’t work for us. So my second option José Pizarro, part of the regeneration of Broadgate Circle worked out perfectly as it’s open all day! With classy interiors and legs of ham hung from the bar, the place means business and all the better for it, as we were all well up for a mid-afternoon feed to match the watering we’d already had. Greeted by friendly staff, even though we had an idea of must-haves from the menu, our server was well on hand to make suggestions, which on this occasion I was happy to receive. All initial thoughts of ‘we’ll just order a few dishes….’, ended up becoming quite a feast with a few bottles of Reisling added for good measure and we enjoyed every second of it. The service was lovely and the food was impeccable, including a sublime marinated octopus, beautiful Iberico ham where the fat simply dissolves on the tongue and the meat is rich, nutty and flavourful, gloriously uber soft meaty pork cheeks and prawn fritters with unctuous aioli (which I might have to try make at home). We ate mid Saturday afternoon so the place was very quiet, with us being the only customers at the time, but I can imagine that after work weekdays it’s probably doing a good trade and I can see why. 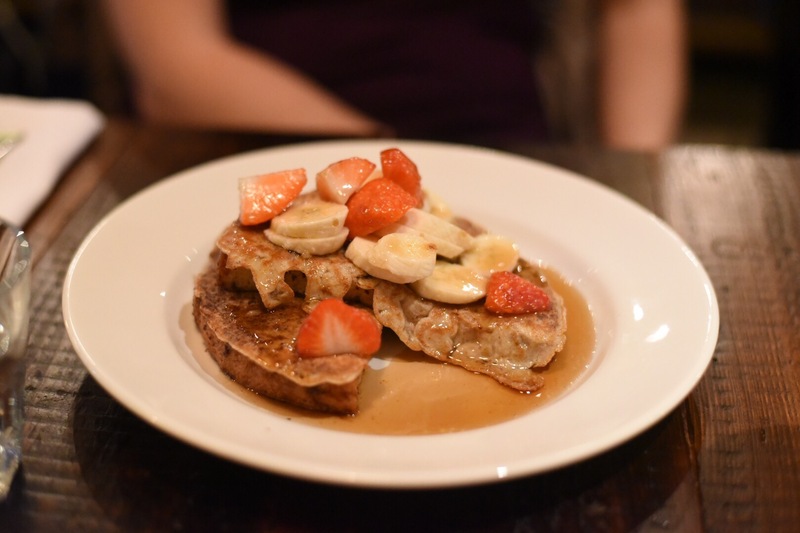 Pizarro’s has two other eateries in Bermondsey, both of which I’d love to try out…..! 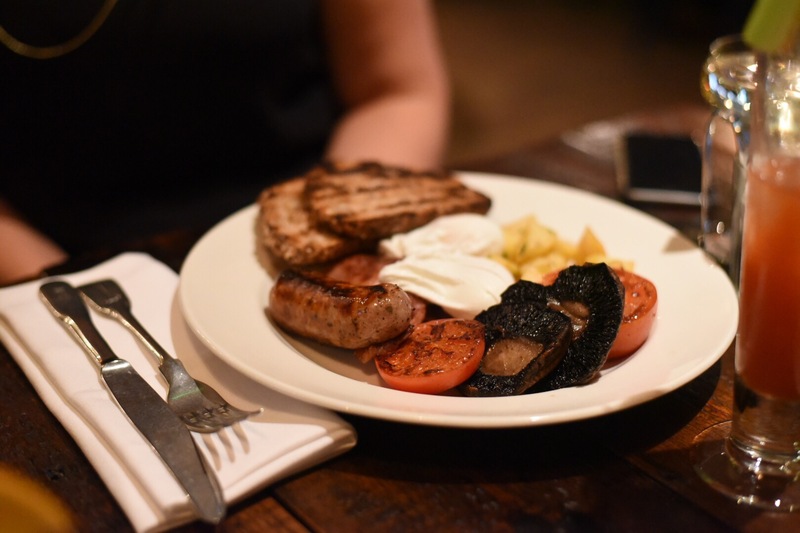 The Leeds food scene continues to grow from strength to strength, and one which has stood out from the crowd of this new breed is Ox Club. Anyone who loves food, who’s been in Leeds over the last year will probably have eaten something from Belgrave Music Hall conjured up by Ben Davy, the mastermind behind Dough Boys, Patty Smiths and British Street Food Award winners Fu-Schnikens. 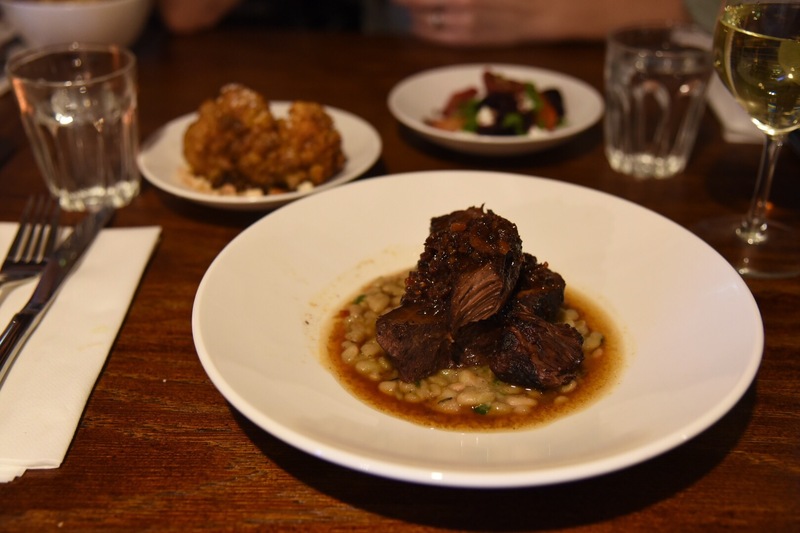 Ox Club’s hangar steak had already become a hit after a few flirtations at Belgrave, however it was their highly anticipated opening in Headrow House, even though delayed which became a bonus early Christmas present for Leeds folk. 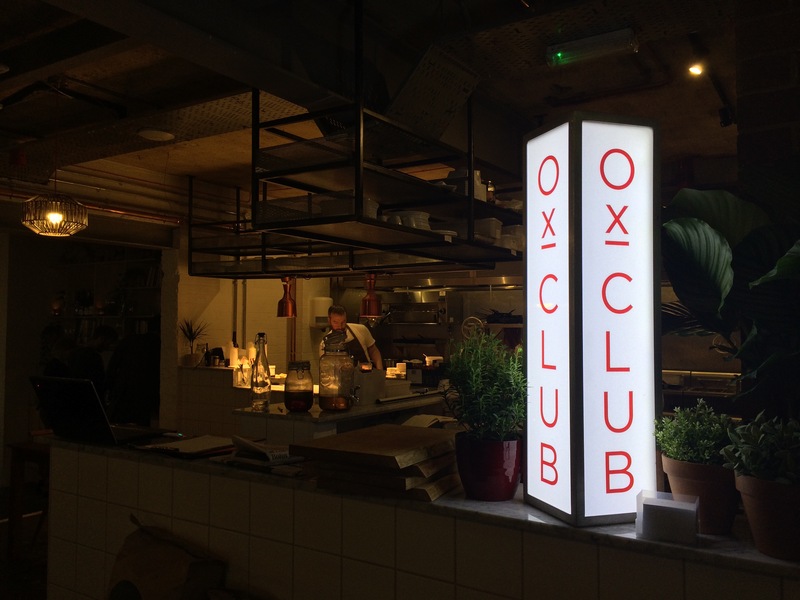 Its launch had the desired effect with a steady stream of yummy photos filling my Instagram feed, doing the inevitable and making me very eager to get my chops around some Ox Club fare! With dismay I thought it may be months until I’d be back in the north, but the food gods looked favourably upon me with a mates’ birthday dinner. Reading the news literally made me whoop with utter joy, so I decided to try brunch too – nothing wrong with a double whammy, eh?! Having seen the space in its early building site days and as Big Lil’s, its previous guise, the place is completely transformed with an understated dining space – bare wood, concrete floors and white painted brick walls. An open kitchen is adorned with the beast of a Grillworks Grill, providing the fire power to bring out the best in local produce showcased in the menu. Their thoughtful menus salute inspiration from a range of food cultures, in particular from a trip in North American with influences subtly reflected. 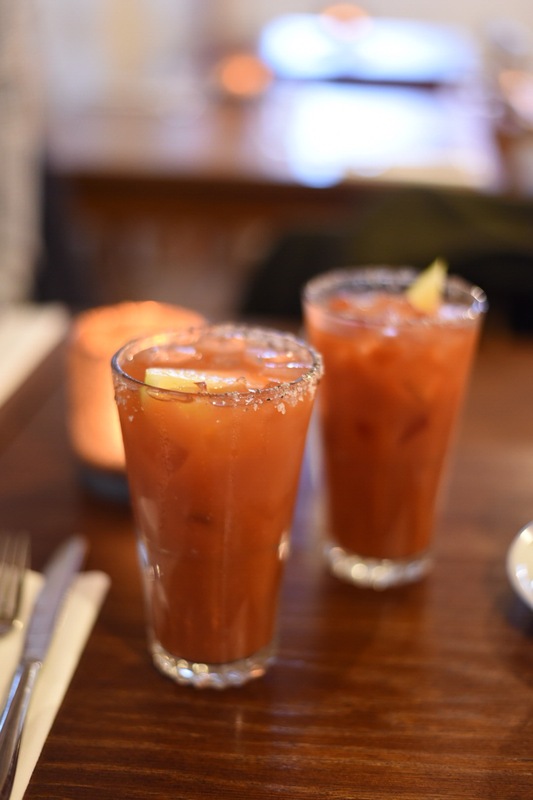 Let’s start with brunch first – as per usual drinks to whet the appetite were of major importance with a Bloody Mary, Ox Club have a pimped up version with a simply genius move of using their very own steak infused vodka…yes you read right – S.T.E.A.K I.N.F.U.S.E.D V.O.D.K.A! So not only is there a balancing act from a smack of Tabasco heat, tomato sourness etc….there’s also steak meatiness! At the time this was the only brunch cocktail on the books, much to my disappointment, so I stuck to a trusty North Star coffee. Service is relaxed and easy going, all in a good way as people don’t take themselves too seriously here, but still give a helping hand with the menu if required. 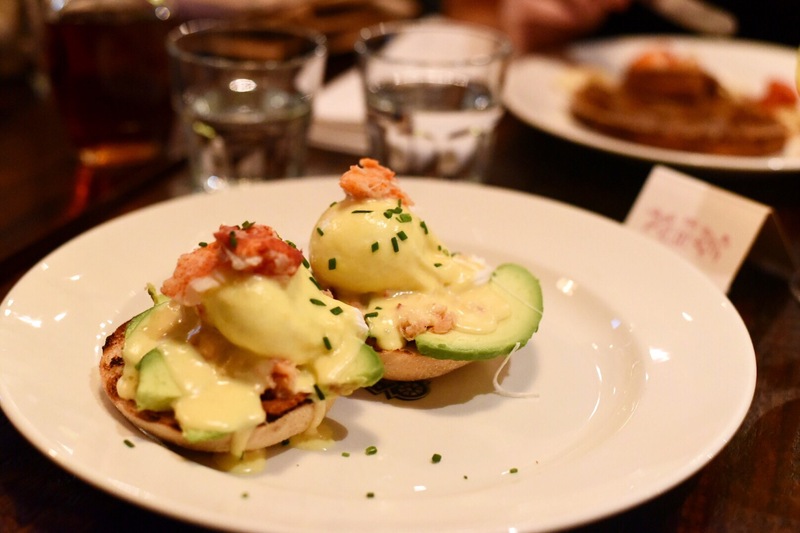 Expect food that’s something a little different from the norm – where boundaries are pushed as far as mainstream breakfast or brunch goes. There were three of us, but four dishes ordered – why? Well, I’m basically a greedy little bugger and didn’t want to settle on one, ordering a conservative two. 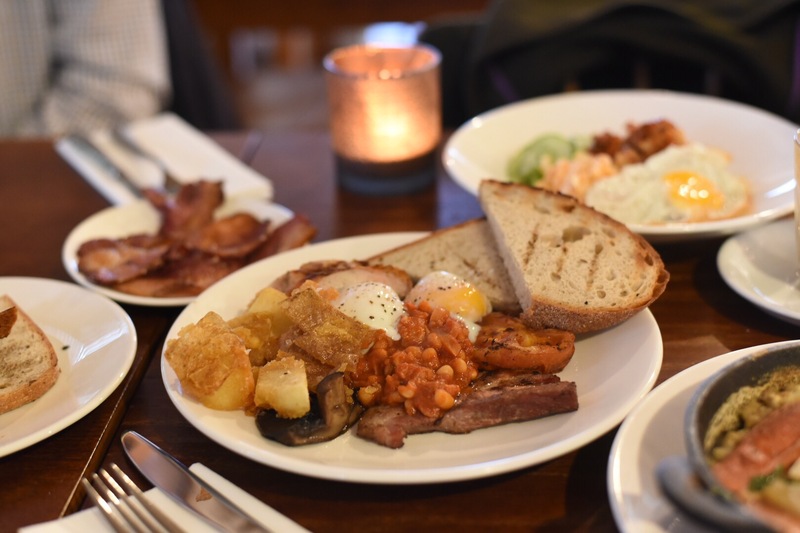 For all establishments serving breakfast/brunch it’s hard to get away from having a version of the full English on the roster. However, similarly to their evolution of Bloody Mary they have their own take which includes pork belly, German sausage and home fries. With extra bacon added on the side the other half was suitably well fed to tackle the rest of the day. In fact, the pork belly was so good they should put that on the sides menu, because I’d be all over it! Kimchi chicken was my first port of call – the amalgamation of a multitude of tastes and textures playing around in my mouth was a joy! Crispy chicken, sourness and heat of fermented kimchi, balanced by the nutty wild rice and the addition of a fried egg with runny yolk makes it a winning dish! Cassoulet was my second choice – a comforting dish with some tasty elements; in particular the sausages and Guinea fowl. However it lacked a little something, mainly because the flageolet beans were a touch under seasoned. 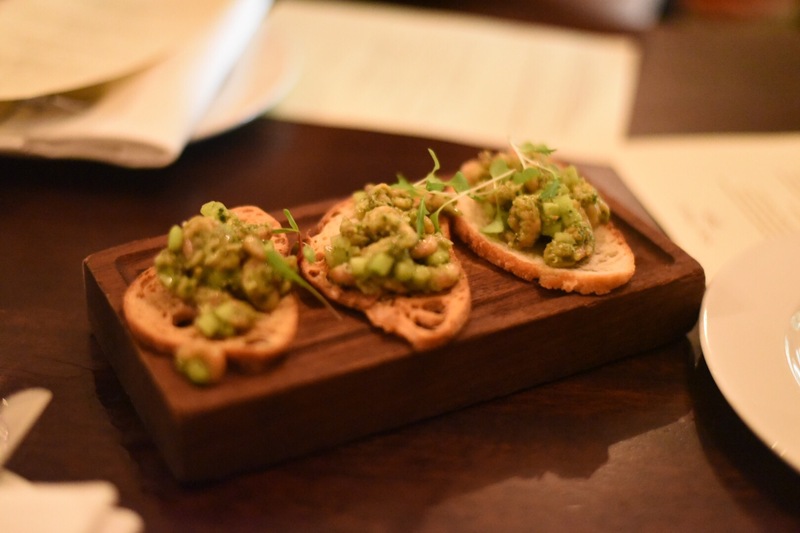 Their evening menu follows the small plates trend with dishes like hangar steak, ox cheek and razor clams, as well as plenty to tempt vegetable lovers. 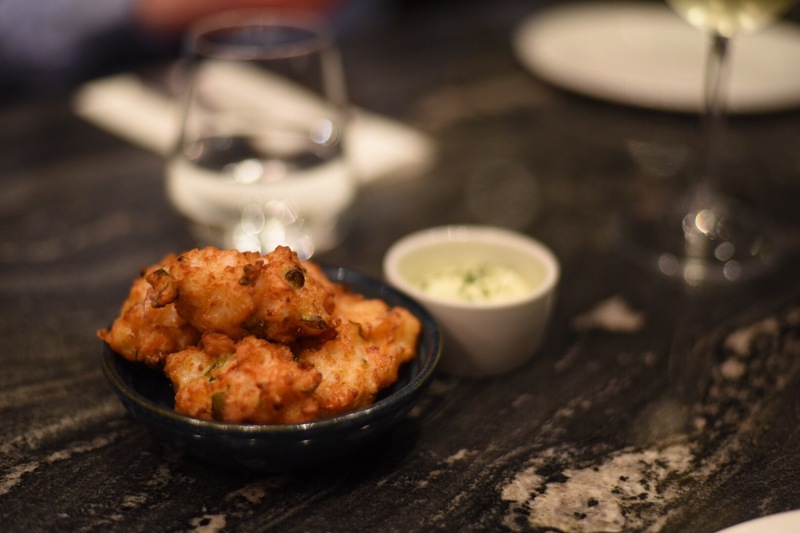 Notably a roasted cauliflower plate that’s quickly gained cult status and been at the forefront of diners memories! 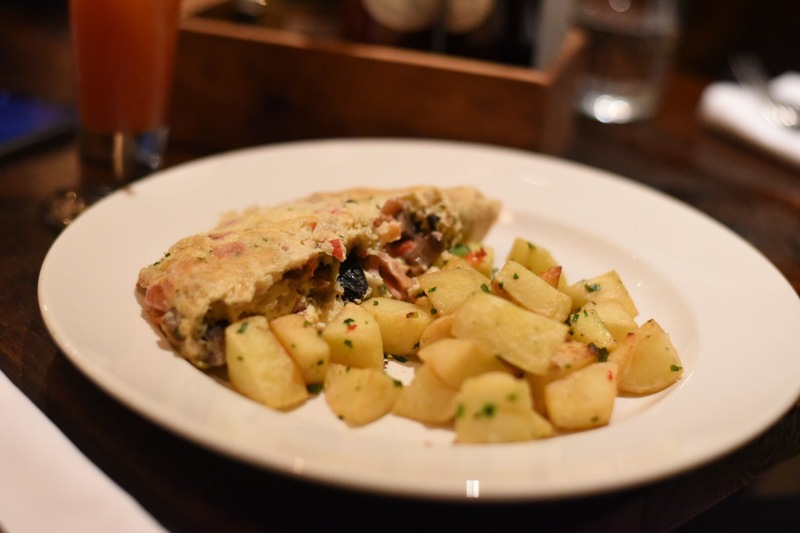 Highlights off the menu were many, my favourite picks – chicken schmaltz, not on the menu as such but it was an opening gambit I’d be happy to start a meal with any day! Some restaurants may offer olive oil and Balsamic vinegar, not here – this nectar from the food gods was basically like chicken dripping, or in my mind roast chicken in liquid form. 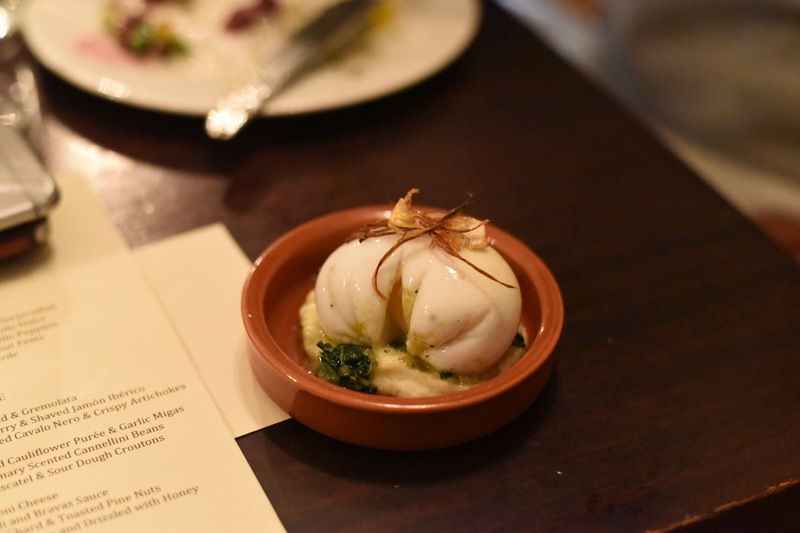 The burrata was another favourite, something so simple giving maximum pleasure – beautifully creamy and smokey, treated simply with fennel, lemon and black pepper was a treat! Melt in the mouth Ox cheek that’d been cooked until its meaty gelatinous texture lovingly gave up in my mouth, bringing along with it deep flavours – sublime! Hangar steak beautifully cooked, a little more salsa verde with its umami herbiness would’ve made it even more awesome. 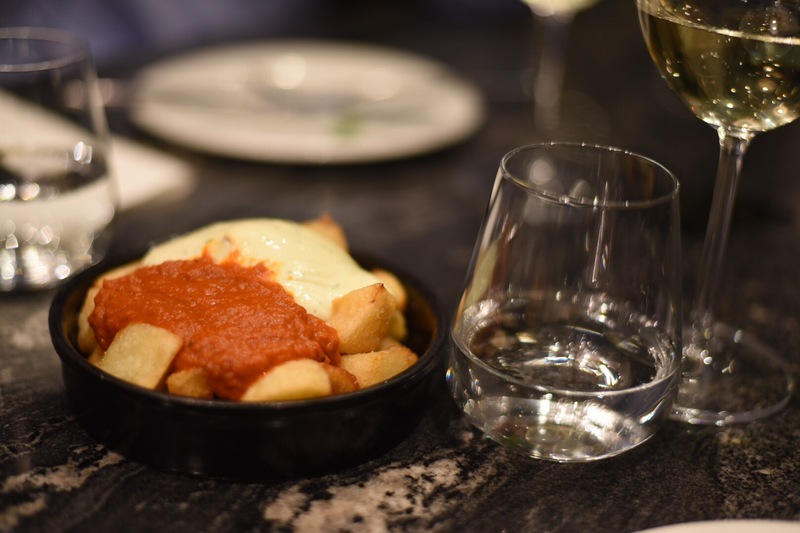 It came with cracking chips too, with smoked sea salt and Bloody Mary ketchup – they’ve really thought of everything! Roasted cauliflower – this supposed ‘side dish’ has been winning the hearts of everyone and I’m not surprised. I’ve tried this veg roasted a few times, not always successfully. When done well it’s incredible and full of flavour, the innate taste of the vegetable changes and it’s brilliant at taking on more intense flavours. With a piquant romesco sauce and flaked almonds it’s a must order dish, even if your not a fan of the veg, this dish could win you over. Dessert-wise the lemon tart was always my first choice, I’m not the greatest dessert lover usually, but I can be tempted by something citrusy and this is one of my favourites, so much so it was our wedding dessert. As this only needs a few ingredients a lot can go wrong, so a pastry that’s short and crumbly is compulsory, filled with a silky creamy lemon filling, possessing a sharp enough hit of lemon just enough so you don’t wince. Ox Club’s was right up there and top notch. It was only a matter of time before food maestro Ben Davy and his pals would open up a fully fledged establishment, with grown up plates of food which don’t cost the earth – Leeds is a very lucky place to have them! Birthday celebration meals can be a little tricky to organise for large groups I reckon, trying to satisfy different tastes can be a fiddly problem to get your head around and having something that pleases the whole crowd can take some thought! 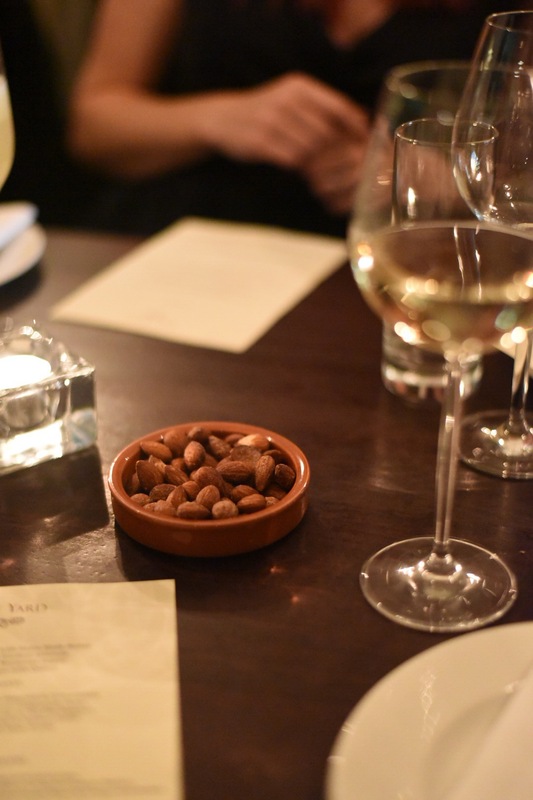 For a mates birthday, we had a few of these issues to work around and after a bit of research I went for tapas at Salt Yard, on Goodge Street in central London. With specific dietary requirements at the forefront of my mind I was keen to make this was a matter of importance when booking. The staff at Salt Yard couldn’t be faulted in this respect, producing an individual menu for a friend with a severe egg allergy and providing extra fish and veg dishes for a couple who were Halal. Being the Christmas season the restaurant offered two set menus, at £40 and £45 per person, with plenty of choice on each we collectively decided on the less expensive of the two. On the night, three of the party were running very late and with a need to vacate our table by 9pm, I was a little worried we’d struggle for time and knowing how stressful it can be for staff I was a bit concerned. Forty-five minutes later we were all accounted for and dinner could begin – a steady stream of dishes came thick and fast, it was obvious the kitchen and waiting staff were trying their best to get food to our table, which pleased me no end because I was starving!! Of all the dishes, my favourites were the salt cod brandade with egg which was beautiful, a perfectly poached egg with a yolk that runs effortlessly and paired with the slightly salty brandade it was a favourite amongst the table, oh also the pork belly (typical I know!). The deep fried courgette flowers were the source of amusement on the plate, but that’s just us being childish and facetious, they tasted great though even though the batter could’ve been lighter. The meat dishes were popular, in particular the pork belly which was one of the stand out dishes of the evening. The bavette of venison may’ve looked like a mess on the plate, but the meat was beautiful, I’ve had better roasted cauliflower though (Ox Club in Leeds!!!). Not everything was a success with the whole table – the cured mackerel was a little hit and miss, it pretty much depended on which bit you took. Some pieces were chunkier than others making them harder to eat, I was canny to choose the thinner pieces so didn’t have the same problem. The ricotta doughnuts didn’t work for me – the grainy texture was off putting and after trying a couple I sadly left the rest. On the whole, I reckon the group had an enjoyable evening and the birthday girl was certainly happy with the restaurant choice. We were all pretty stuffed, even though some dishes were loved more than others, I think it’s hard to please everyone with such a diverse menu.